One of the recurring excuses for not getting prepared is that preparedness costs too much. It’s true that some aspects of preparedness are going to require an investment of money, however, cost is no excuse for not doing something! There are lots of ways to get prepared for free! Start with these 25 ways to prepare without spending a dime. Got a free way to prepare? Share in the comments! 1. Get to know your neighbors. Invite them over for dinner, or plan a block party to get to know a lot at the same time. Strike up conversations when you see each other. What do they do for work? Do they have any special skills or equipment? These are the people that will be surrounding you if a disaster strikes at home. Knowing your neighbors will help you know which are potential partners and which could be potential threats. It will also allow you to better help them. As a side benefit, you may need someone to feed your dogs while you’re on vacation and a friendly relationship with a neighbor goes a long way! 2. Make a plan. Plan what you will do if you need to evacuate–where to meet, routes to travel, how to communicate between family members, what to take, what to do with any pets or livestock. Plan what to do if you need to shelter in place–what supplies you need, how to stay cool or warm if the power is out, how to get home if you are away when the emergency strikes. Plan your food storage–what foods you need, how to store them, where to store them, recipes you’ll be able to make with the foods you have stored. There are lots of plans that can be made, pick one and get your plan in place. 3. Inventory your supplies. How can you know what you need if you don’t know what you have? Take an inventory of your food, emergency supplies, medical supplies. You might have more than you think! Then compare with one of those lists from #2 of what you feel you need and you’ll know where to focus your efforts. 4. Gather documents. Start with this list. You already have most of these at your house, but where? If they aren’t in a location that is easy to grab and run with, gather them up! 5. Scout your evacuation route. How are you evacuating? By car, bike, walking? Take a little trip along that route. Here’s what to look for along the way. 6. Track what you eat to calculate what you need. 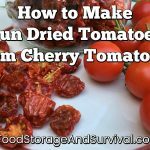 I talk about this in depth in my book, Food Storage for Self-Sufficiency and Survival. Tally how many packages of different foods you use in a month. How many jars of pasta sauce, how many cans of peaches, how many cans of tuna? For things that last longer like condiments or oils, mark the date you started using them on the bottle or a spreadsheet and note how long they last. With these numbers, you’ll be able to calculate how many of each item you need for a one, three, six, twelve month or longer supply of that item. Remember to take into consideration any eating away from home you do and round up to cover those meals. 7. Go for a hike. A great way to get some exercise and fresh air, hiking can also be coupled with scouting your evacuation route, identifying wild edibles, finding shelter, building a fire, and more. 8. Exercise. Anything you like here. Walk, run, do martial arts, aerobics, dance, weightlifting, swimming, or whatever you enjoy. Your body is one of your most important preps, and it needs to be taken care of if you’re planning to outrun the zombies, or even just make it through the initial emergency and the work that could accompany the aftermath. 9. Save seeds. Growing a garden? Practice saving some seeds. As a bonus, if you started with non-hybrid plants, your seeds can grow next year’s garden! Some great ways to start seed saving are with cucumbers, squash, radish, and tomato. I talked about seed saving from these and even more garden plants on two podcasts here and here. 10. Forage. Are there any wild edibles where you live? I bet there are. Even cities have wild plants growing that can be used for food. Go find some. Make sure you’re 100% positive on plant identification as well as how to prepare and eat what you foraged. 11. Change a tire. This will come in handy some day. Even if you get help when you actually need to change the tire, it’s good to know where your jack and spare tire are and how to use them. 12. Learn how to shut off utilities at your home. Where is the shut-off for gas? Electricity? Water? Is there more than one? Do you need a special tool to shut it off? Many natural disasters could result in broken utility lines or it being unsafe to have the utilities running at your home. Knowing how to shut them off can keep a disaster from becoming an even bigger disaster. 13. Check out books from your library and read. There are a lot of great survival guides on the market, including my book, as well as a bounteous supply of survivalist fiction. Both can provide ideas and instruction for getting yourself and your family prepared. If your library doesn’t have the book you want, see if there’s a way to request it. If you have Amazon Prime, you can also check out many of these books to your e-reader for free! 14. Read blogs. Hey, you’re already doing it! Way to go! While you’re at it, check out some of my other favorite preparedness blogs. 15. Watch YouTube videos. For those of you who are visual learners, YouTube is absolutely a gold mine for preparedness information. And yes, I have a channel there! 16. Learn a skill. Do you know someone who has a skill you want to learn? They’d probably love to get you started! Canning, needlework, car repairs, home repairs, shooting. Ask someone to help you learn and you’ll have another skill in your quiver. Don’t know someone to learn from? Head back to the books, blogs, and YouTube and you might just find what you need. 17. Fill water bottles. Have any empty 2 liter or juice jugs? The hard clear plastic type. Wash them out and fill them up with water from your tap. Now you have some water storage! That was easy. 18. Ask for preparedness gear as gifts. This is one way to get those items that are going to require money to get. Birthdays, anniversaries, Christmas, they’re all a great time to ask for what you want. If someone doesn’t know what to get you, give them your preparedness gear wish list. 19. Use gift cards for preparedness gear. If you acquire gift cards, either as gifts or as a byproduct of something like your credit card “rewards” program, use them for preparedness supplies! Even places like home decor stores or office supply stores have products that can help in your preparedness efforts. Use those gift cards to get prepped! 20. Start a fire. Once you’re comfortable starting a fire, challenge yourself. Start a fire without matches. Start a fire in the rain or snow or wind. Start a fire when all you think you can find is wet wood. Get comfortable starting fires under various circumstances. Check this out for a primer on the how and why of lighting a fire for survival to get started. 21. Build a shelter in the woods. This goes along with your hike! If you don’t have woods nearby, scout for shelter locations between your home and work, or along your evacuation route. 22. Make a meal without your stove. There is a learning curve to each method of powerless cooking! Not sure how to start cooking without your stove? Here are eight great ways to cook when the power is out. 23. Hold an evacuation drill. This is a fun one. Surprise your family with a mock emergency. There’s been a disaster and you have 10 minutes to leave the house. Go! See what you grab and what you forget, then hold an analysis meeting, make some lists, and try again another day to see if you improved! For a great reference on emergency evacuations with some pre-made lists to help you out, check out Lisa Bedford’s book, Emergency Evacuations. 24. Shut your utilities off for a day. You don’t have to actually shut them off, but don’t use them. Tape your faucets shut and turn the heater or air conditioner off. No turning on lights, either! See how you fare without gas, electricity, or running water! These kinds of tests find holes in your emergency plans faster than kids find that chocolate you hid in your sock drawer! 25. No shopping challenge. This is another excellent challenge for living on what you have. Don’t go shopping for at least two weeks. No stops for more bread, milk, eggs, your daily soda break, or shampoo. How do you do? What areas of your emergency supplies do you need to strengthen? 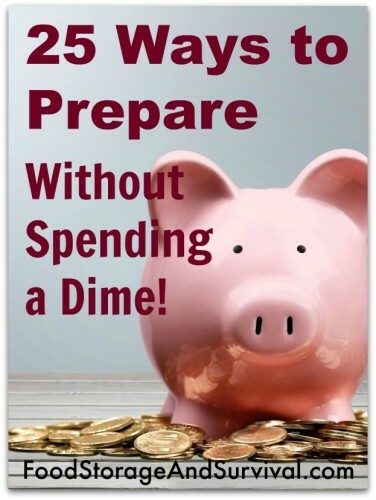 No money is no excuse for not getting prepared. Do you know a way to get prepared for free? Scroll down to the comments section below and share so we can all benefit! Being 73 years old, I look for lots of ways to save money and collect freebies. One thing I’d like to suggest is old tires. These things can be used for lots of DIY projects, I.E. building storm and bullet proof walls, mini gardens, swings for kids, etc. You can even start a small business collecting these tires and selling them to used tire dealers. You won’t get rich from it, but it does provide a small income stream, off the books, for use in buying other prepper items. I would recommend that you collect only 13″, 14″, or 15″ tires because these are the ones that used dealers want. 17″ and 18″ tires, like for pick-ups and SUV’s are not so easily disposed of, plus they are heavier. Fine for building; hard to handle. You can find them at most large automobile dealerships for free. Either that or at major tire shops, Wal-marts, etc. Some places may even give you a couple of bucks just for picking them up; especially if you do so regularly. Start thinking of other ways to make money, off the grid. Ask your family for ideas. Make prepping a family affair. Response to the tire changing. : when the weather is nice , Take time to teach your wife , daughters, son how to properly change a tire to the spare tire, this is much better than during a storm an not knowing what your doing,, Now that that is said, AAA auto club will come an change your tire , An many other things , Also, If AAA tell’s you it will be a long wait, Invest in a product that will air up your tire an seal the puncture ( nail) . There are many brands of ” flat tire repair”Many of the new cars are coming without a spare tire ( reduce weight) Instead , a flat tire fix aerosol can is in the trunk. ; Some times you can’t wait for someone to change the tire, The fix a flat will come to be a time saver. A few years back I had only one bathroom in my home. My kids were small at the time. The pipes to our shower had burst. And we had to order all the necessary piping and parts needed. Had to wait 3 days for the right part. Husband is a handyman so it was to get done, just not right away. We all needed showering so we heated water on the stove poured into 2 -1/2 gallon pitchers. It took 1 and 1/2 per kid to clean. Pouring over head in shower. 1and 1/2for husband and 2 gallons for me. I have shoulder length hair. We never really thought about how much water we wasted until that time. Since then we made changes with all of our faucets and shower heads to help conserve the water. I even have a barrel in my yard collecting water from the gutters on the house. This is for the vegetable garden. We have seen a huge difference in the water bill too.